R1992, Patrick O'Connor. Sdlg. 80-6. Upon opening, the petals are a web of fine purple veins over a white suffusion. Quickly fades to what appears to be ice blue. Styles creamy white. Orange spear signal. Cajun Caper x unknown. 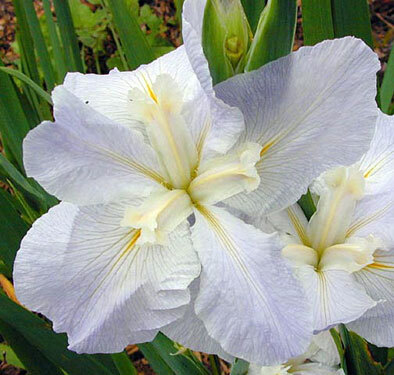 38", E. This is a vigorous garden iris, one of the few icy blues available. Looks great in the light of early evening. Pollen parent is almost surely Mac's Blue Heaven, although a bee did the work.